While we only reported on the school finance cost study yesterday, it was not the only thing to happen! 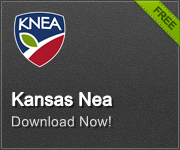 permits local school districts to offer every student an opportunity to participate in a firearms safety program based on the NRA’s Eddie Eagle program, the Kansas Department of Wildlife and Parks Hunter Safety program, or another research-based firearms safety program. Schools would not be required to offer such programs nor would students be required to participate. There were a couple of amendments. The committee added the State Fire Marshall to the state agencies with whom the SBOE must consult. This amendment was requested by the Fire Marshall. 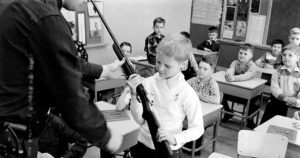 An amendment by Rep. Aurand (R-Belleville) would have stripped out the requirement that local districts offering firearm safety would have to offer programs that met the SBOE standards. His argument was that if the program was optional, why should the local board be prohibited from offering the program of their choice? The Aurand amendment passed but a subsequent amendment from Rep. Sutton (R-Gardner) specified that any program must meet those standards. An interesting bit of flipping for sure! The Senate Select Committee on School Finance held a hearing today on SB 422 which would mandate that every school district issue a 30% Local Option Budget. The bill is most likely another attempt to ensure that the Supreme Court consider LOB dollars as foundation aid. Most districts are at or beyond 30% now but some are still below. For those districts, it would be a mandatory property tax increase. The bill was opposed by agricultural interests and the school lobby stayed neutral. The bill also attempts to fix the two LOB provisions found by the Supreme Court to violate equity. There is still some debate about whether or not this bill does that adequately. The powerpoint from yesterday’s presentation by Dr. Lori Taylor and Jason Willis is now available for your reading pleasure. Click here to view a PDF version of yesterday’s presentation.